Michael Clarke and Ricky Ponting both are Australian cricket players, who scored double century against India in the 4th Test day - 2 at Adelaide Oval. Ricky Ponting Scored 221 runs from facing 404 balls with 21 fours. Michael Clarke Scored 210 runs form facing 275 balls with 26 fours and 1 six. 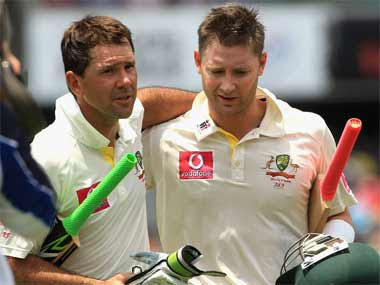 The partnership between the Clarke and Ponting was 386 runs. After the great partnership Australia scored 604/7 dec from 157 overs in the 1st innings.